Celebrities are rallying to raise money toward the relief of Haiti. (CNN) -- Hollywood is sending its thoughts, hopes, tweets, prayers and money to the people of Haiti. Academy Award-winning screenwriter and director Paul Haggis ("Crash") was at the forefront of mobilizing Hollywood's elite to lend their support for Haiti even before Tuesday's devastating earthquake. Since starting the organization Artists for Peace and Justice in 2009 (http://www.artistsforpeaceandjustice.com/), Haggis has brought awareness of the island nation's plight to stars like Charlize Theron, Diane Lane, Josh Brolin, Maria Bello, Olivia Wilde, Oliver Stone and James Franco. Haggis created the group after meeting the Rev. Rick Frechette, an American doctor, priest and community organizer who has worked in the slums of the country's capital, Port-au-Prince, for over two decades. The director was so inspired by Frechette's work that he began organizing field trips to Haiti with his celebrity friends and raising funds to funnel directly to Frechette's efforts to build hospitals, schools and orphanages. "After coming back from my trip I realized I had to do something to help, so I grabbed a bunch of my friends and created Artists for Peace and Justice. We have managed to sponsor three of their schools and part of a hospital," Haggis said. In his years of service in Haiti, Frechette has built a children's hospital, 18 street schools and street clinics in addition to providing clean drinking water and food daily to the inhabitants of the poorest slums in Port-au-Prince. 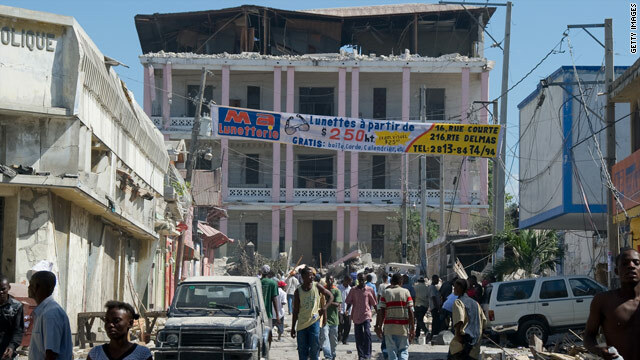 Frechette's hospital in Petionville was at the epicenter of Tuesday's earthquake and has collapsed. His St. Damien Pediatric Hospital, the Francisville Trade School and Kay Saint Germaine Rehabilitation Center have all been horribly damaged. Since the quake struck, Haggis has managed to reach Frechette only on e-mail. "He is in the Dominican Republic trying to reach Haiti and as soon as he gets on the ground there he is going to contact me with an assessment," Haggis said. One of the friends that Haggis brought on board with Artists for Peace and Justice is actress Maria Bello, who traveled to Haiti a year ago and was able to reach Frechette for a brief phone call on Wednesday morning. "He said he was on his way to go dig his people out," Bello said. "A lot of his volunteers have been buried. He said to get some equipment and put on some gloves and help him dig people out. Haiti was so devastated a year ago when we went down there that I cannot imagine what it is like now." When Bello visited the country she helped Frechette build a graveyard and bury local children who didn't survive the various illnesses that caused them to visit his pediatric hospital. "We are trying to mobilize right now and figure out if it is the best thing to mobilize a special rescue team here to go there," Bello said. "House" cast-member and Artists for Peace and Justice co-founder Olivia Wilde traveled with the group right before the holidays. "Having been there so recently I can tell you it was already a pretty desperate situation but Father Rick's programs were working effectively and what we need is to make sure things get up and running again," Wilde said. During her trip the actress visited an orphanage founded by Frechette as well as a general hospital that served as one of the few alternatives to the priest's pediatric hospital. "I can tell you the general hospital was a very desperate place before this earthquake with sometimes three kids to a bed and carts in a hallway with dead children." Artists for Peace and Justice is in the process of organizing a fundraiser in Los Angeles, California, next Saturday night to raise relief funds. All the funds raised by the organization will go directly to Frechette to help aid the people of Haiti. "The Office" cast-member Rainn Wilson traveled to Haiti in October with his wife. They worked with the organizations Planting Peace (http://www.plantingpeace.org/) and The Mona Foundation (http://www.monafoundation.org/). "We met beautiful, vital students in many schools, street children trying to educate themselves and many selfless Haitian teachers and doctors working to be of service to their country. I don't know if they are all alive or dead right now and it's breaking my heart," Wilson said via e-mail. "The hotel we stayed at and most of the places we visited now lie in rubble. I believe in the power of prayer and I believe in the power of service. Even if you can only give 20 bucks, that will go a long, long way in a country as devastatingly poor as Haiti. Please also send prayers and hope that the world takes drastic action to remedy this horrific disaster." Haitian-American actress Garcelle Beauvais spent Tuesday night trying to contact family members who were still in the country. "We found out that almost everybody is safe but we have a couple of cousins who are missing right now and my sisters-in-law slept in their cars last night. My brother-in-law was in his car when the earthquake started happening and he thought they were being bombed," said Beauvais, who is working with the Edeyo Foundation (http://www.edeyo.org/) to raise money and awareness. "We are trying to organize now. Since it is such short notice we are trying to see how the airport is there and see what we can to do to go there and help." Ben Stiller, Adam Lambert and Lindsay Lohan all took to Twitter to urge people to lend their help and attention to the devastated nation. "People in Haiti need our help and attention right now," Stiller posted to the social media Web site on Tuesday. "Please, everyone donate even the smallest of what you can. We are so fortunate. Let us give where truly needed," Lambert tweeted. Oprah Winfrey began her talk show on Wednesday by asking viewers to donate to the Red Cross. "This is a time where we, as a global nation, should come together and support those who are in need," Winfrey said. Global recording artist Usher has been working to mobilize youth worldwide to help Haiti through his nonprofit, Usher's New Look (http://www.ushersnewlook.org/). "With Haiti in a state of emergency right now, young people do have the power to save lives. I am asking young people of all ages to mobilize by organizing local fundraisers with the proceeds going to their peers in Haiti. This is one way we all can make a difference," Usher said via e-mail.